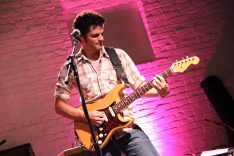 Guitarist and composer Mark Lettieri has gained an international following courtesy of his work with the GRAMMY award-winning fusion ensemble, Snarky Puppy. Yet recent years have seen the Texas resident becoming more active away from the group: collaborating with drummer Nate Smith and members of Vulfpeck on funky offshoot project The Fearless Flyers, as well as releasing solo records with Ropeadope records, and building his reputation as an educator through clinics and online guitar workshops. His adoption of the often-overlooked baritone electric guitar, coupled with his intuitive understanding of tone and innate musicality, have placed him high on the list of many guitar enthusiast’s favourite players. But flashy playing is by no means his style, as his new track Seuss Pants demonstrates. A richly layered, jazz, rock and R&B infused track, it has drawn Mark comparisons with Jeff Beck in the comments section, thanks to his deft touch with the whammy bar and free-flowing command of the scales. Mark’s new album, Things of that Nature, is slated for release in Spring. Mark has alluded to it having a rougher and more natural mix, preserving the details “airbrushed” out of certain modern productions: things like string scrapes, amplifier hum… the gritty details that give records character and humanity. We’re sure to find out more about the record ahead of Mark Lettieri’s return to Band on the Wall on 24th April 2019.